Happy Holidays and Happy New Year from your Heyworth Public Library. We love serving our community whether it is finding the right book or cake pan, providing children’s programing or our Friday movies. We are here for you, even if it is just to provide a quiet space in our Community Room. We are so much larger than our walls. After School Movies, 3:20 p.m. every Friday the library is open. Bring a friend and your own snack! All drinks need to have a screw on cap – no juice pouches or cans please. We are thrilled to offer crafters a space to create and socialize! This group is very willing to teach anyone who would like to learn to knit or crochet. We have yarn, instructions for beginning projects, and needles to get you started on a new hobby. If you want to learn how to knit or crochet you must sign up to attend, so our group can have all you need ready for the evening. If you are a knitter or a crafter looking to socialize with others in our area, just show up as your schedule allows. Available to anyone 4th grade and up. This group is also wanting to provide blankets to a local Project Linus chapter. Heyworth Businesses Then and Now at 6 p.m. in the Community Room with a short presentation on the collected histories and pictures the Heyworth History Club have gathered to date. Join us for this informative presentation, but more importantly bring items to share to broaden our collective knowledge of local business history. Do you have a ruler, baking mitt, or magnets in your possession of previous area businesses? Or pictures of area businesses? These are the items of interest we are looking to document. Give away trinkets with the business names are items we are looking to take pictures of to document this part of our local history. Heyworth History Club, “History in Your Own Backyard” Winter Series, 6 p.m. – 8 p.m., RSVP by January 18. Monday Evening Book Club, Friendswood by Rene Steinke, 4th Mondays at 6:30 p.m.
We are always seeking new people to join us! Give us a try this new year. We have a friendly talkative bunch. It’s a great way to meet new people in town. Books in regular and large print available, as well as audiobook, at the library for checkout, stop in and get yours today. 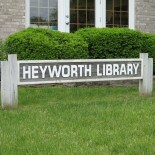 This entry was posted on December 22, 2015 by Heyworth Public Library District.